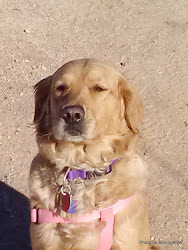 We were going to leave Quartzsite on Friday but, we refilled our water tank and are now staying “a few more” days. Others have decided to stay as well but we are down to 6 Montanas and have picked up two Motorhomes, (friends of one of the Montana owners). Plans are being made for a Super Bowl Party here in the desert. Montana 5th wheels have mountain decals on their sides as part of the logo. Several of the Montana Owners have added decals to personalize their 5th wheels. 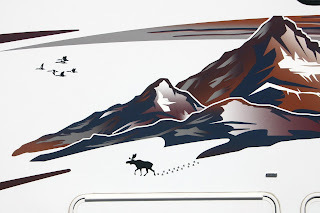 Most have added a moose walking out of the existing logo mountains; some have added prospectors with a mule or Jeeps driving up the logo mountains. We didn’t want to be left out so, on Thursday we personalized our mountains by adding decals. We added a moose walking out of the mountains and of course we added birds. 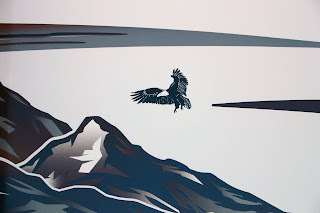 We added geese flying out of the mountains and an eagle flying toward the mountains on the other side. However to really personalize our rig we added our name to the back of the trailer. and Parker to see the Parker Dam. It was a beautiful drive, the desert had a green carpet of plants starting to appear after last weekend’s rain. This March should be a spectacular wildflower season! We added Red-tail Hawk and Ferruginous Hawk to our Quartzsite Bird list today. The Quartzsite night sky is amazing. There is a slight light dome from Parker and Havasu City and you can see some lights from downtown Quartzsite. However, now that we are past the full moon and the moon is rising later the sky is very dark. We have never seen the winter Milky Way look so bright and of course an amazing number of stars. Unfortunately the nights that are clear are very windy and COLD! The nights when there isn’t any wind are not clear and are just COLD. So, we haven’t taken out the telescopes at all but, just go out to look at the stars for a few minutes before going to bed. 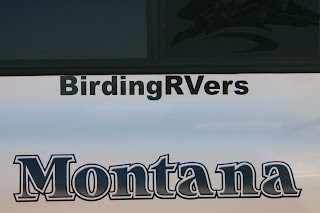 I love what you did to your Montana with the bird decals etc. We have a Montana too & you've given me some ideas! 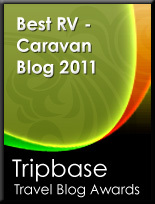 Are you still going to the Gypsy Rally in Casa Grande? If you are, maybe we'll get a chance to meet. I am enjoying following your journal.